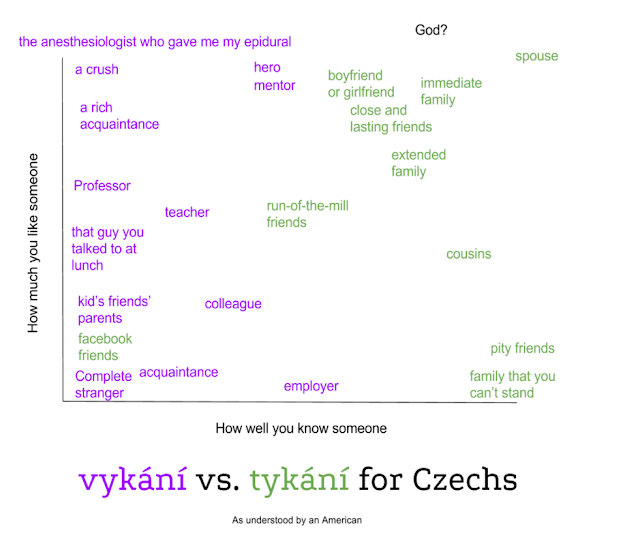 At this, the close of my first week of actually making a real and concerted effort to study Czech the language (though I have made several other really casual attempts before), I have to take a minute to write about a huge cultural difference that I have noticed: vykání vs. tykání. Of course, this concept is not new to me. I lived for a year in France, after all, where on se vouvoie/on se tutoie. A huge difference in how it happens in France vs. v Česko: the ritual of moving from one to the other. It’s a slight nuance, but it totally makes me blush, and it is difficult to understand precisely why. There is that thing in English with “thou”, which is a really interesting parallel linguistically, but practically, it has zero correlation. Also, obviously, we’re not talking about the vykání-ing of multiple people or the tykání-ing of children and family, but rather that elusive moment when a friendship becomes close enough to be tykání-able. Whereas in France, it’s a lot more casual and can be initiated by whomever, apparently in Česko, there are a whole set of rules regarding who initiates it. My source is 2 guys and 1 girl Czech, plus hoards of articles here, here, here, here, here and here. The more I read about it, the more I bite my nails in anxiety, hoping that I will not (or have not) screwed it up. It makes me blush. But why the heck am I blushing!? It isn’t embarrassing for Czechs; it’s a cultural tradition. It’s just that in my culture, it is so, so, so utterly awkward. How can I say it? Well, I’ll put it this way. It’s like the translation of Beauty and the Beast in Czech. Belle goes the entire film vykání-ing the Beast, until the very, very end when she says, “Milujě tě!” But seriously, even after their famous dance scene, they still remain at the vykání level of closeness (or should I say, distance). Perhaps this is because it is a fairytale, and relationships in fairytales have more archaic rules? I dunno. Every Czech person I have asked says that the person who initiates the tykání-ing has to be the one with the “higher” social status, such as the boss to an employee, an older person to a younger person, and (most stressful of all for me) a woman to a man. (This is yet another example of how being male would solve some Czech-language learning problems.) I find it super fascinating that women are somehow “higher” on the social echelon. Or more respected, or something. In my culture, it is a really fine, thin line between chivalry and sexism, and women are totally measured on the same scale as men (which, IMO, is the ultimate sexism, and I despise this philosophy). Talking to people at church. I think this is a really niche, specific part of Mormon culture and it is not universally American. But at church, I am Sister Challis. Unless it’s my peer/friend, who will usually call me Kate. When someone refers to me as “Sister Challis” then it feels like they are talking about me in the third person. The founder of the LDS church, the prophet Joseph Smith, used to refer to people as, “Brother Brigham”, with brother/sister + first name. Pretty much nobody that I know does that, unless they are being funny. If I bring my children to my friend’s house to play with her children (or vice versa), and for some reason I have to direct my child to address my friend (for example, to ask where the bathroom is or something), I say to my child, “Hey, you can ask Miss Stacy where the bathroom is.” It is always “Miss + first name” for moms even though we are all married. This is the same here in Iowa as it was in Texas and Utah. Perhaps it is also a Mormon thing. All my mom friends are LDS, pretty much. My most respected, loved professors in college, I call them by their first name. Mary, Kirk, Dil, Doug, for example. In my culture, friends hardly ever discuss their friendship outright. If, for some awkward reason, you have to make sure that you really are friends, you would never put yourself in the position of being able to be refused. That is the weirdest part of tykání-age, in my opinion. I would just tell them that I consider them my friend, and let them do what they may with that meta information. It has happened to me in the past when one of my (female) friends told me that they consider me to be their “best” friend. Even though I did not necessarily reciprocate the sentiment, I agreed with her vocally. It would have been the ultimate rudeness not to. Did it change our relationship after that? I suppose it didn’t change very much for her; afterwards, I always felt slightly sad about the fact that she liked me more than I liked her. I mean, never, never is it a normal thing in my culture to say, “hey, we’re friends, right?” or, “So…are we friends?” That’s just so weird and awkward it’s laughable. I remember doing this one time when I was in kindergarten, actually. I was petrified because I wanted very badly to know if Ashley was my friend, but I thought that to be friends, she had to tell me explicitly. So, with trembling knees and butterflies in my stomach, I approached her (another six year old girl) and asked, “Are you my friend?” She said, “Yes!” and went on eating her lunch as if nothing happened, and I breathed a sigh of relief and from then on decided that it was completely stupid to ask if somebody is your friend. Always assume that they are. If you don’t, you look and feel and sound stupid. Does age trump gender in the hierarchy of initiating tykání? How do Czechs handle cases of close family friends? Say there is a man who is close friends with your family. Your kids call him “uncle.” Your daughter turns 15 (or so). Does the uncle have to have the am-I-tykání-able discussion? Who initiates it? A boss in the workplace. How should he handle this? Or how about any situation where you are vykání to everybody except for one or two select few. How do you avoid emphasizing this inequality? Just phrasing things so you don’t have to use vykání or tykání? What does tykání-ing mean in a male-female relationship? Might it be taken the wrong way? Are platonic male-female friendships a common thing in the Czech Republic? How embarrassing is it for Czech adolescent girls, to transition to the tykání-bestowers? How does it compare to the awkwardness of American adolescence? If you refuse to accept somebody else’s tykání-ing, that is really rude. But I am sure it happens sometimes. If it does, then later who initiates the discussion for tykání-ness, or is it just so offensive that they refused the first time that a friendship cannot be born? Does it feel like somebody is talking about you in the third person when somebody vykání’s you? Does it feel respectful or cold (like somebody wants to maintain their distance from you)? Do you ever vykání any of your relatives, for example, those that you only see once a year? Or is seeing relatives only once a year an American thing? How context dependent is this? 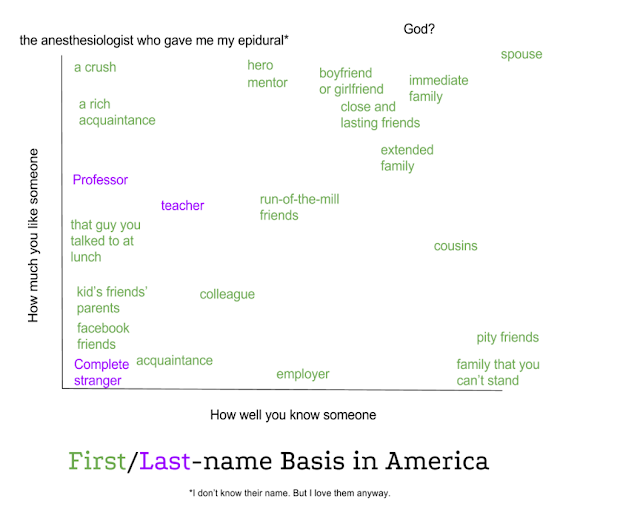 Might where you are determine how you call someone at least sometimes? Do you spend a lot of time discussing it, or is it a casual three word question with a yes or no answer like in France? I have heard of coworkers who knew each other 30 years and one asked if they can tykat the other said no. I have always vykat at my older relatives, any one I don't know, anyone in authority. I can't see the first two images; I'd guess the permissions are not set correctly? I'll try to get to the questions later. I know that it's true, what you say about Czechs being patient and not expecting me, a foreigner, to really "get" it. But I want to get it. There is not really a specific point at which you achieve linguistic/cultural fluency; "it's not the destination, but the journey that matters," and other such platitudes. I wrote this mainly to figure out *why* precisely it made me feel so incredibly awkward that it even made me blush to imagine having to do this ever (even if I never really will…though…that is the plan…). I also thought my Czech friends/associates would find it mildly interesting. I think the major reaction that I have had from EVERY Czech person with whom I have discussed this is, "You know, it's really NOT that big of a deal. You do not need to feel anxious about this." I think it is interesting. Surely it really is not a big deal in your culture. First date, first kiss, etc.